Lake Orumiyeh, one of the largest salt lakes in the world, has been ravaged by severe droughts in recent years; 90 percent of its surface area has dried up. The lake’s water surface area has expanded almost 100 percent, standing at 1,800 square km over last year’s 900 km². The lake has experienced a 7-meter fall in its water level of late. Thanks to rainfall in the fall, it presently stands at 1,270.55 meters above sea level, 31 centimeters up over September 2014 when it was 1,270.24 meters. Measured over the past 15 months, at its deepest point the water does not go beyond four meters, a drastic drop in comparison with 15 meters in the years before the lake was gripped by the crisis. 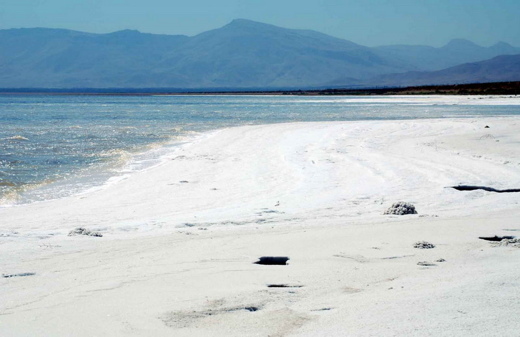 Lake Orumiyeh, one of the largest salt lakes in the world, has been ravaged by severe droughts over the recent years. Some 90 percent of the surface area of this beautiful huge lake which used to be as vast as 5,700 km² has dried up and approximately as little as two billion cubic meters of water is left in it.